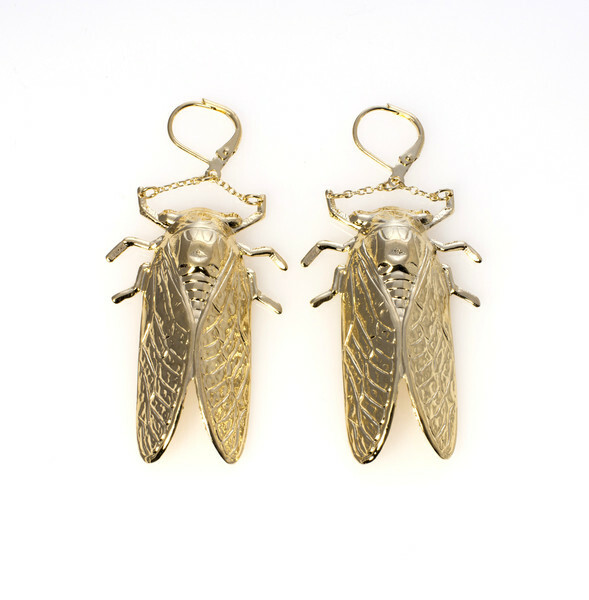 From Charleston’s own Croghan’s Jewel Box goldbug earrings (photo below) to J.Crew’s most recent window displays, the fashion industry is bugging out – pardon my pun. Springs hottest new trend: bugs. I am all over this trend. I’ve always liked the creepy crawlers; in an artistic sense, that is. Even my gallery wall has watercolor painting of 8-legged creatures. There’s something a little cool about bugs in the artistic world. 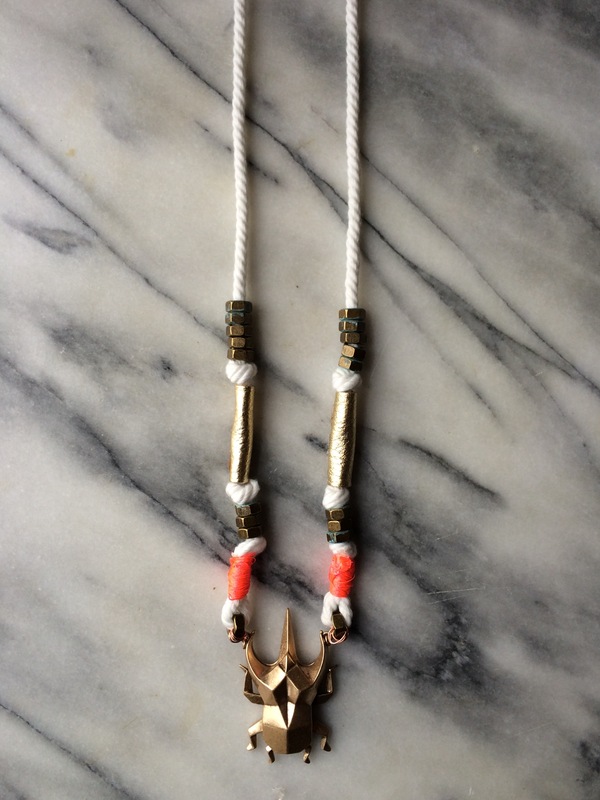 Today I’ll be teaching my fantastic followers how to make this killer necklace. It’s the perfect pairing of edge and feminine, summer vibes: the bright-white, nautical-inspired base, the happy-go-lucky neon color pop, and of course, the statement beetle that I found at Hobby Lobby. 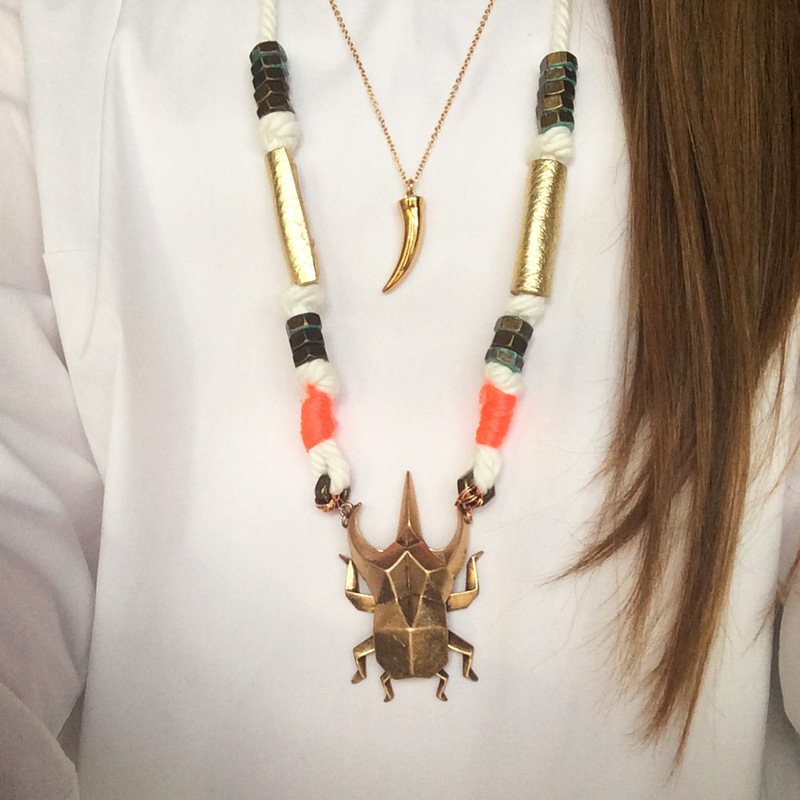 All and all, this necklace cost about $30 – a steal compared to the Croghan’s find above! Cut your yard of rope in half. Start with one half of the rope and string 5 nuts about 10 inches up the rope. I chose verdigris shaded nuts which means they have a slight aqua tone. 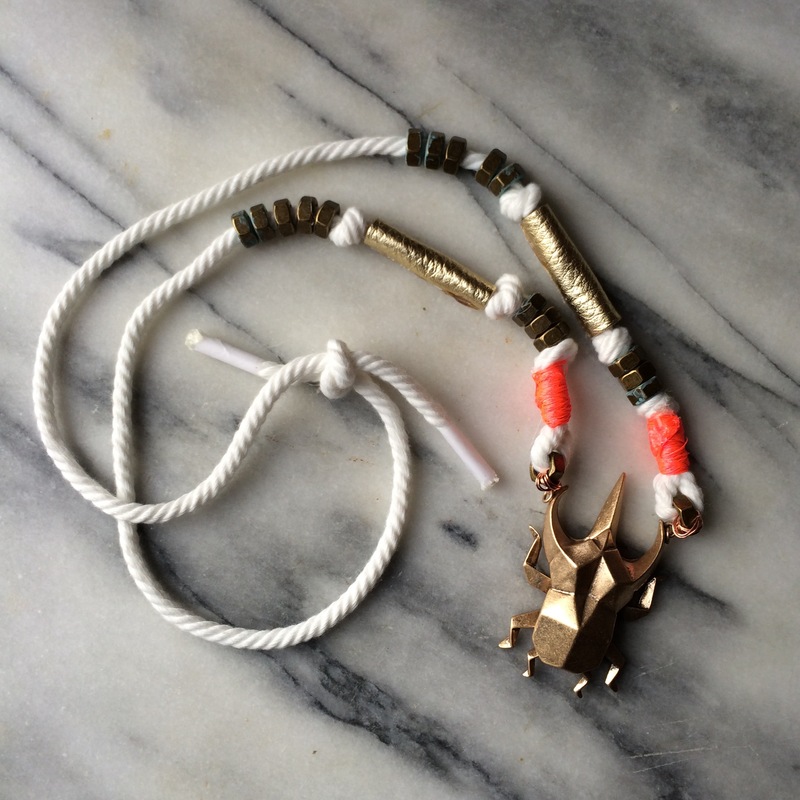 One you’ve strung your 5 nuts, tie a knot just below them to hold in place and to add dimension to your necklace. 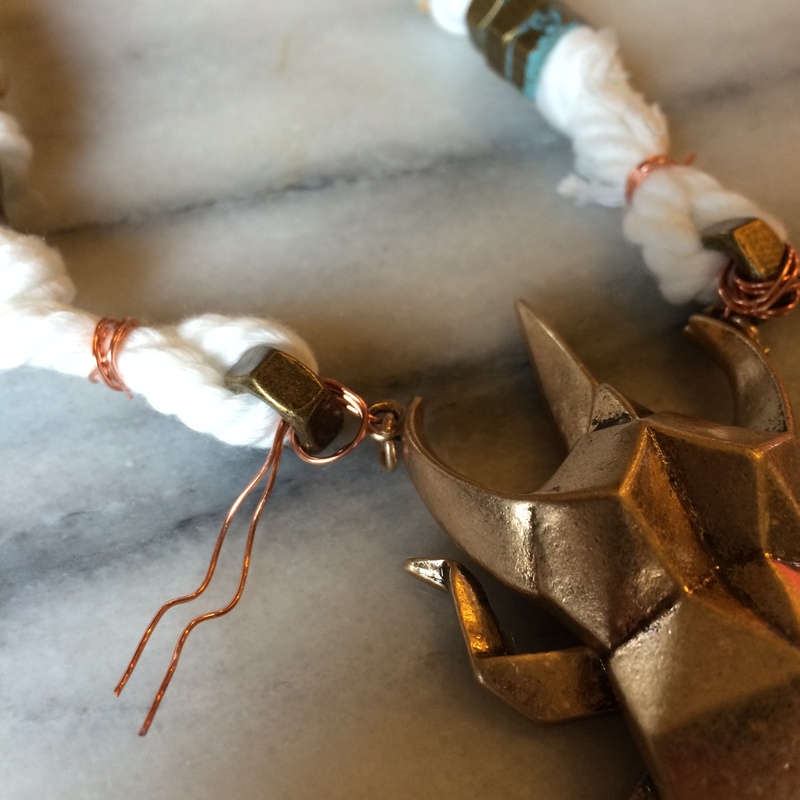 Using your hot glue gun or super glue, adhere your leather or fabric to the rope by rolling it around the rope and gluing in place. I used hot glue because I had it on hand, but super glue will be much thinner and easier to work with. 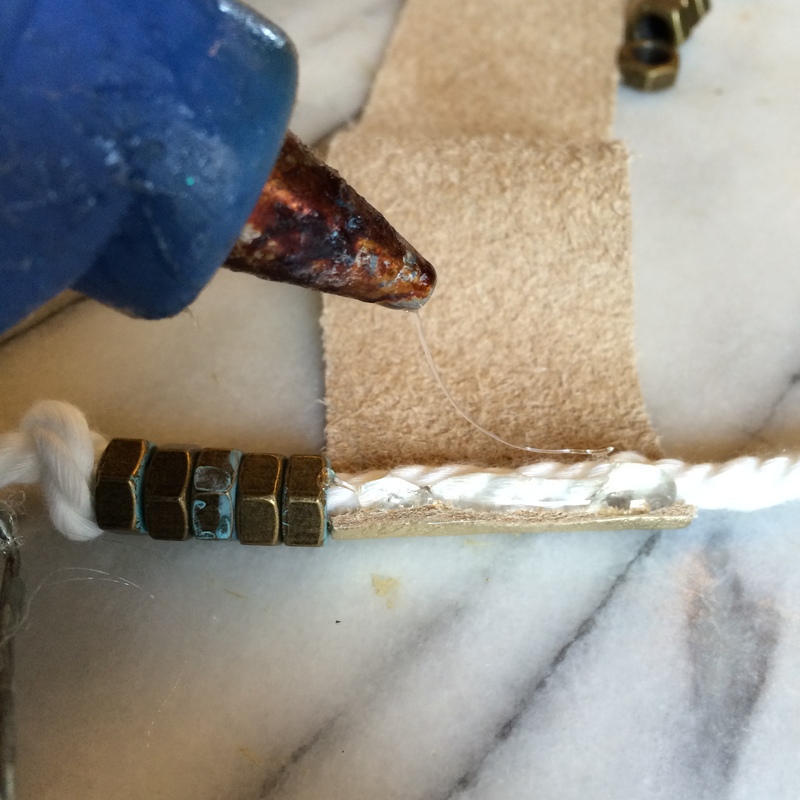 Once stable, tie a knot in the rope at the bottom of the leather/fabric piece and string 3 more for a patterned look. 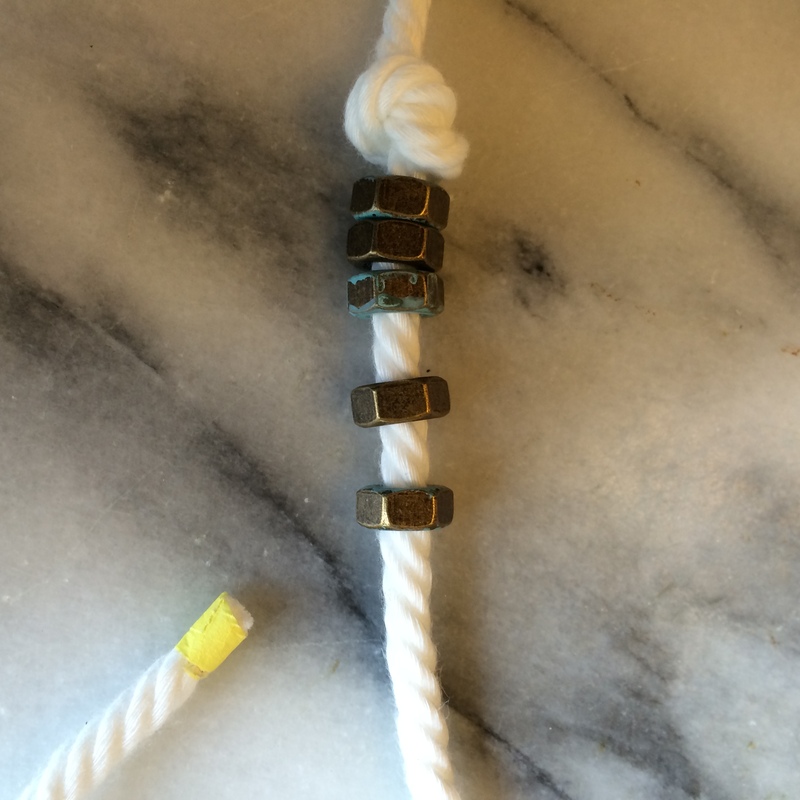 Tie a knot below your last three washers. Then, string one more. This final washer should be about an inch below the knot. Using the final washer as a center point, create a ‘U’ with your rope. Using about 5-inches of wire, wrap the ‘U’ together to form a loop. This will be where side 1 of your necklace ends. Cut off all excess rope. 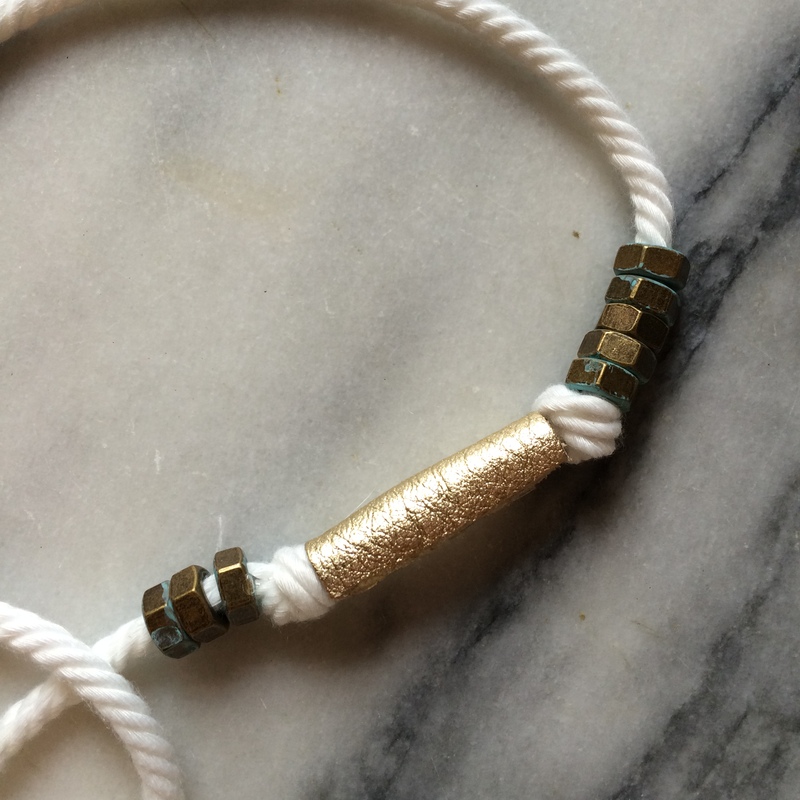 Attach your medallion or statement bead by wrapping its loop with the final washer using 3-inches of wire. Finally, add a pop of color! 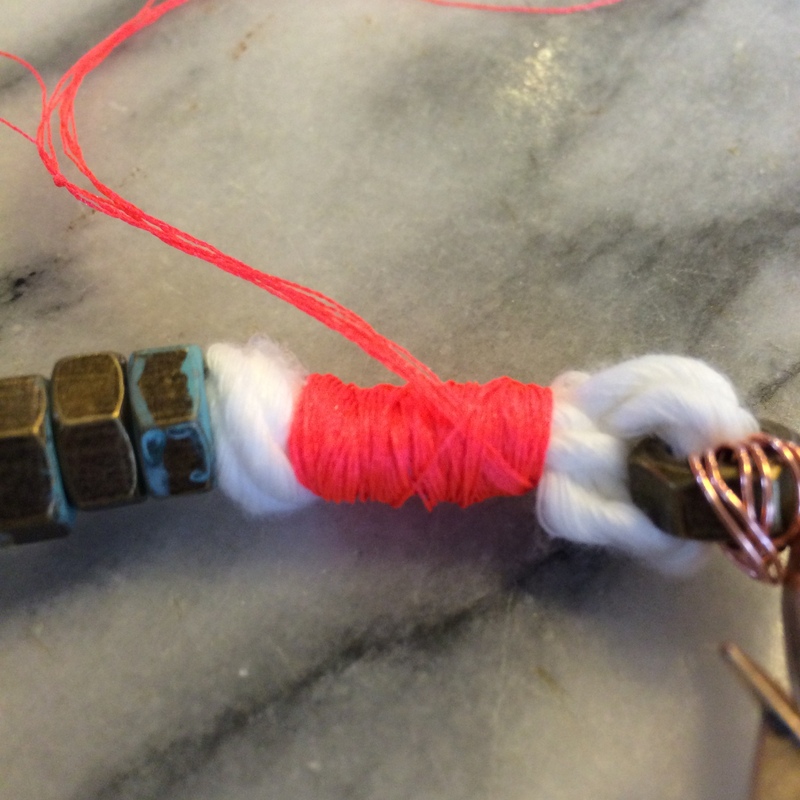 Hide the looping wire in Step #3 by wrapping it with neon thread. Careful, this step takes longer with thinner thread so try doubling-up your strings when wrapping. 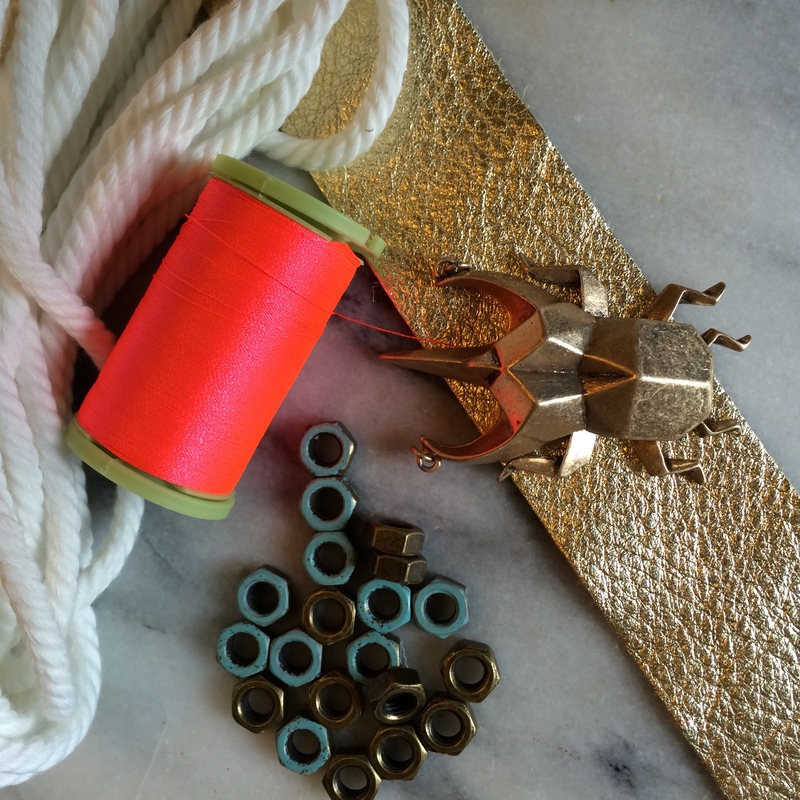 Secure the neon thread by tying a knot in the final wrapping. For extra strength, I added a small drop of glue to the back side. 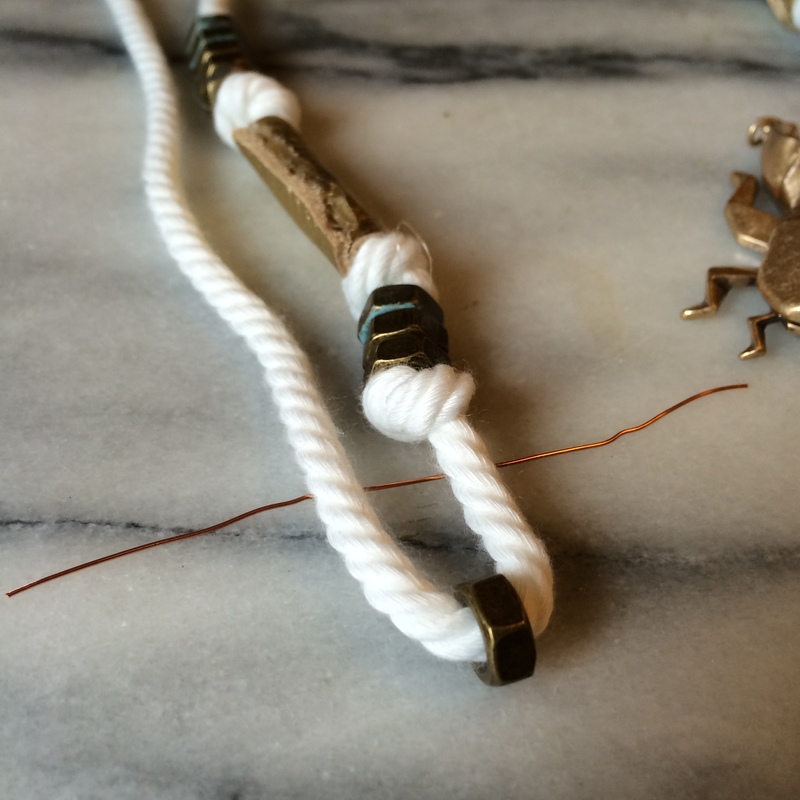 Repeat Steps #1-6 on side two of your necklace. I chose to attach the two ends casually by tying a knot.